Apple Blossom Dreams: La Vie en Rose - Teaser! Omg Astri I'm sooo excited for your pattern !!! I have been looking for a pattern to make a blanket for my mom... Her nickname - giving to her by my dad who,passed away 4 years ago - is Rose . So everything roses reminds me of her. I have been looking for a blanket with a big rose on it . But I have never found what I had in mind ... A quilt like kind of rose blanket ... N the sneak peak at your blanket just tell me this will be absolutely perfect ... Exactly what I had imagined to make for her ... I can't wait to see the whole thing !!! I know I already love it . That is fantastic Tanya. Thank you! It looks pretty!! Similar to a cross stitch pattern. Yes it is similar. :-) Thanks for coming by Preeti! I enjoyed your last series and now I'm excited to see more crochet. Thank you Kim. You know I ALWAYS enjoy hearing from you! I think you will like the next series of posts. I truly can't wait to see it all finished-- it's going to be amazing! I did not know what perler beads were so I looked them up! They look like fun and yes this looks like it could be a perler beads pattern too! It's gorgeous Astri. Can't wait to see more. 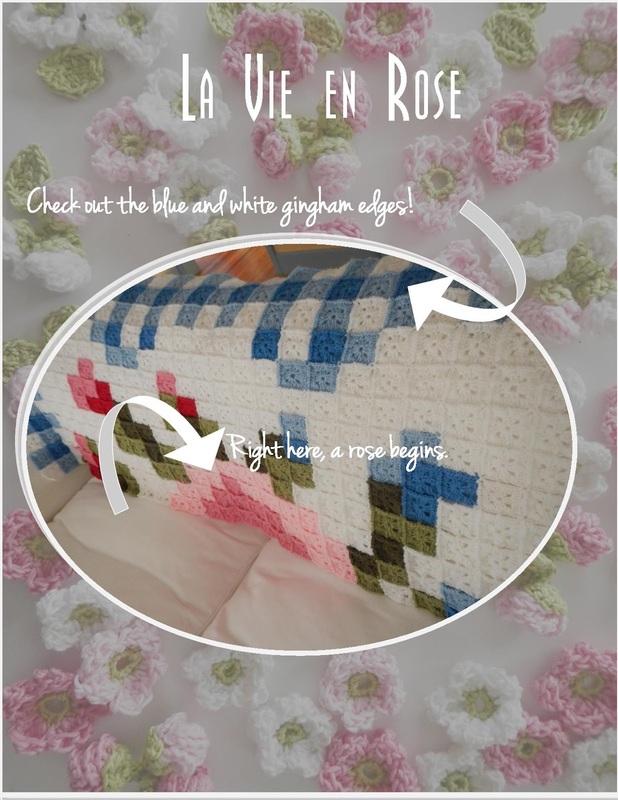 Your new rose afghan pattern is looking great. It looks like a very big project as the squares are so small, but I bet it will be stunning once finished! Your rose looks fantastic already! Thank you Jarka, nice to hear from you! Your Norway trip looked absolutely amazing Astri, so glad you had a wonderful time. Your blanket looks amazing too. Good luck on the pattern. Thank you Meredith! I am coming by to visit your blog soon. Can't wait! SQUEEEEEEE!!! Hi Astri I have been silently following your blog forever but I just HAD to come on over and say hurry, hurry LOL!!! Haha, Shai! I LOVE silent followers, it's sort of like stalking and I like it - I do it too. ;-) There's just simply not enough time to comment on all the great blogs out there. But I like to believe that the" positive reading without commenting" energy is somehow getting to those bloggers and they feel it in some mystic way! Your comment made my morning happy. Did you know that anxiety ridden crocheters favorite word is "hurry"? :-) I will hurry for you and Taci!